and both are being shown. I'll ask the ads team if this is a test, and if so, if we can share the results. The answer to "who reads comments anyway?" might be at hand. ... definitely not a test! 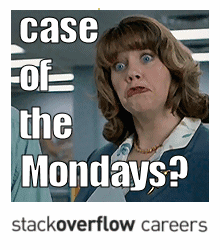 I’m not sure how this ad keeps coming back to haunt us. We fixed it literally years ago and somehow it keeps getting turned on again. I’ll find it and turn it off again today. There is an ad terlife, and we're getting messages from that realm. We have no idea how our software actually works, and we're going to figure it out eventually. Tim Post planned this for months just so he could create a scenario in which a very ill-conceived and horrible pun could plausibly fit. It's somehow Adam Lear's fault. More realistically: We're trying to figure it out, and I think we'll end up having a swag contest around this, somehow. Sounds like SO is A/B testing. The point of the banner isn't to display valid code. It's to get people to click. Not the answer you're looking for? Browse other questions tagged bug status-completed jobs typographical-error . Can we fix this typo in the suggested edits queue? Allow voting on / dismissing job suggestions? Typos in code snippet from a good answer? Unformatted code when formatting the uploaded pictures?